Eunice Hill grew up on a farm in Minnesota. Her first project was an embroidery cross stitch of an elephant that she did in kindergarten. She learned to sew clothing at age nine. By high school, Eunice was making her entire wardrobe, including wool suits, coats and her prom dress. She made her first quilt in 1958. Sewing was put on hold until the early 1970s, when she first learned about quilt blocks. There were no quilt stores or classes, and very few quilting books available, so Eunice was self-taught. She admired the work of Jinny Beyer after seeing Ray of Light, The Great American Quilt Winner in 1977. Eunice never dreamed where quilting would take her. 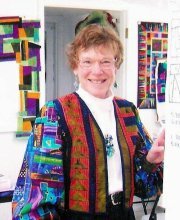 Today, she creates original designs and patterns, and is a retired American Quilter’s Society appraiser. Her quilts have been published in books and calendars, and won prizes in the Paducah Show. In 2004, she was named Minnesota Quilter of the Year. At one time, it took Eunice over 17 years to finish a quilt for her son. She is now a compulsive “finish the project” gal. She enjoys teaching and doing commission quilts for others. “For me, quilting is playing with color and fabrics—what fun!” she says. Jill Boyd (a.k.a. The Quilt Chef) has worked with Quilter’s Store Sedona since 1993. She first learned to quilt when a friend loaned her “The It’s Okay If You Sit on My Quilt Book,” by Mary Ellen Hopkins—along with a rotary cutter, mat and ruler. She drafted her first quilt design on graph paper using a half-inch seam allowance. A year later, she took her first beginning quilting class. After drafting her first quilt design, Jill found herself personalizing off-the-shelf patterns. Soon, she was creating her own designs and teaching classes to customers. As her signature style developed and her sample quilts hung in the shop, customers wanted published patterns and a new business was born. Jill became The Quilt Chef and started cooking with color. She whips up quilt recipes using fabric ingredients from her stash pantry, coupled with spicy accents and embellishments used in small amounts. 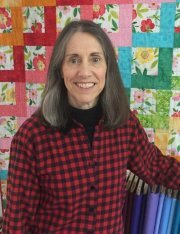 She puts a spin on traditional quilting by experimenting with the latest utensils (quilt tools) and techniques. Lorrie Petersen has enjoyed sewing for many years, making clothing for her family "back in the day." She has been doing handwork, mostly counted cross stitch and crewel embroidery, since the 1950s. In the late 1990s, she stumbled upon the Rocky Mountain Quilt Museum in Golden CO, while traveling with her late husband Blaine in their motor home. Suddenly, a passion was born! She taught herself how to make her first wall quilt in 1999, after finding a book on foundation paper piecing by Carol Doak. Lorrie enjoys a variety of handwork including appliqué, hand quilting, embellishment, embroidery and felted wool appliqué. She loves machine quilting on her HQ Sweet Sixteen and Bernina, and specializes in free motion quilting. Her most recent focus has turned towards creating art quilts. Sharing her love of quilting through teaching has brought Lorrie great joy. She has presented seminars at national motor home conventions to hundreds of quilters, taught quilt classes to members of the Hopi tribe, and engaged quilt enthusiasts in Idaho and Sedona. Her second favorite? "OMG, I can fix that!" Lynda Shephard was born in Kentucky and was fortunate to have a grandmother that mentored her in all kinds of crafts, including sewing. She kept busy raising a family of four, and doing infant foster care for 32 more, until the late 1970s. It was then that she took her first quilt class at the University of Alaska-Anchorage. 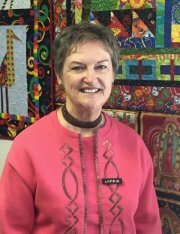 Her teacher, a third-generation Mormon quilter, was very inspiring and Lynda fell in love with quilting. Over the past 16 years, Lynda became interested in making miniature quilts. She sees them as a challenging art form that she has come to enjoy. 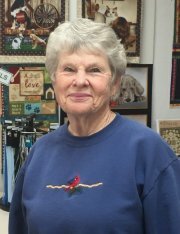 She has created a collection of pieced and appliqued miniatures, and travelled through Arizona, Oregon and Minnesota giving trunk shows to several groups of quilters. In 2000, “Simply Quilts” from HGTV came to her studio and filmed her miniature quilts and a demonstration of her method for creating one. In 2005, Lynda was invited to teach a week-long series of miniature classes at “Quilting in the Desert,” a quilt retreat held in Phoenix, Arizona. 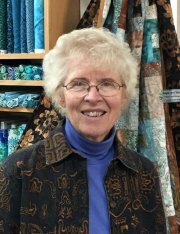 For the past 20 years, Lynda has taught classes in embroidery, hand applique, hand quilting, miniatures, machine applique and wearable clothing at Quilter’s Store Sedona. Ann Magetteri’s motto is, "If it’s worth doing, it’s worth doing well." Ann’s father was a significant role model in her life, stressing the value of ethical behavior, commitment to your work, and honesty in all cases. Ann’s mother, a skilled tailor, taught Ann to sew as a child. Forty years later, New Mexico artist Nancy Young became the catalyst for Ann’s entry into the art world with that ability.